In the world of ZED, the zombie outbreak has come to a close. On day 900 of the outbreak, a PH vaccine was created by the genius scientist Samuel Grace. His vaccine prevents anyone who takes it from becoming infected, but it cannot help those who are already infected. However, creating a vaccine takes guinea pigs. 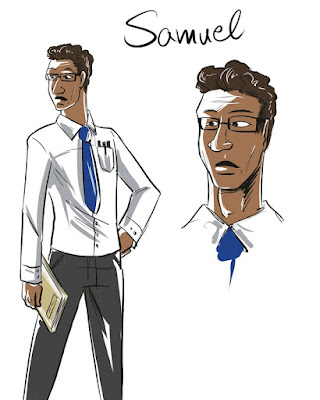 Samuel experimented on many patients, one of whom was his good friend Zed. He just wanted to help Sam create the cure. However, even though he finally achieved it, there are other hidden motives behind Sam’s research into the vaccine. And now, no one knows where to find him. 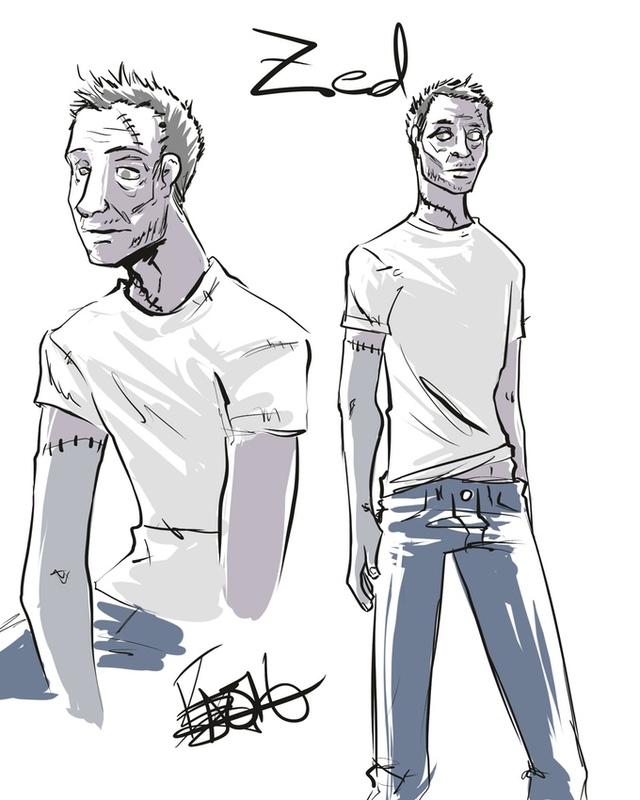 Thanks to Sam’s experimentation, Zed gets all the “powers” of being undead while still keeping his "humanity." Zed is saved from scavengers by Bill, who becomes his friend. Bill is a mortician who helps Zed blend in with other human beings. Rewards include a digital edition of ZED #1 plus a digital copy of Kunstmann’s Warhead #1 ($5), PDFs for both ZED #1 and Alter-Life #1 ($7), and a print copy of ZED #1 in addition to PDFs of both ZED #1 and Alter-Life #1 ($10). The list goes on all the way up to $250 and includes postcards and posters as well. The goal for the project is $3,600, which must be reached by September 1, 2016 at 11:00 AM EDT. You can pledge money to the project here. 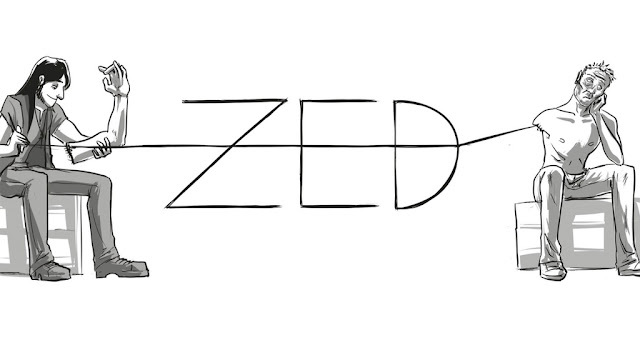 ZED is created and written by Caleb Thusat with artwork and lettering by Katrina Kunstmann. Check out my interview with both of them below. Me: There have been so many zombie stories in film, TV and comics over the years. How does ZED differ from other zombie stories? 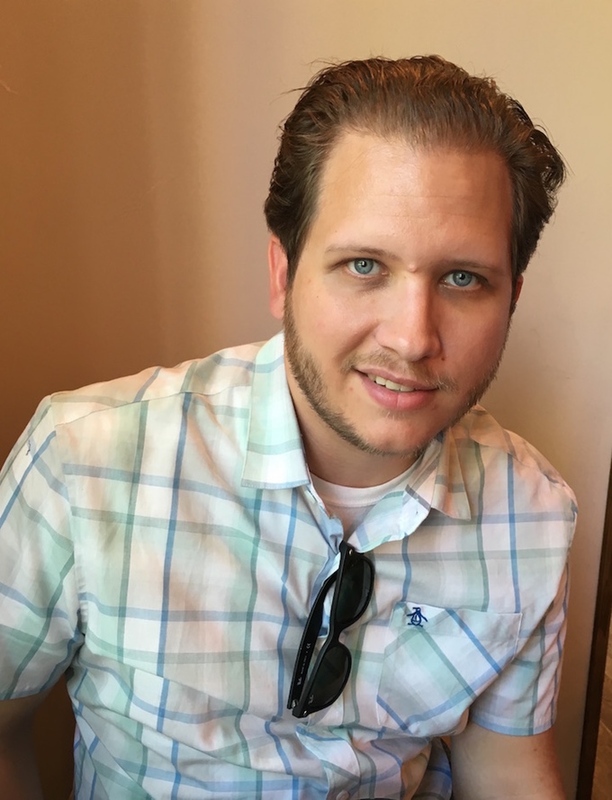 Caleb Thusat: I came to ZED by trying to think of something that hadn’t been done before. Something based in a familiar world, but covered with new ideas. ZED is a Zombie story, but it’s a Zombie as the Hero Story. I basically took a few staples of storytelling that I love and made one amazing story out of them. This is a hero and his sidekick, a man and his best friend, a zombie apocalypse, and the origins of what will be a unique superhero. Me: You mention on the Kickstarter that Zed has the “powers” of a zombie. What abilities does he have? Thusat: Zed is basically like a Frankenstein monster. He is given a special version of the vaccine that allows him to remain cognitive and maintain his “humanity.” His powers are mainly that he can lose limbs and have them replaced by any others, and he cannot die unless he is killed in the typical Zombie fashion: a bullet to the head, or severe head trauma. He also has a special connection to the other remaining infected in the world. Like some vampires have been written in the past, Zed is now part of a hive-mind. He can tell when others like him are close, and he may learn to focus those abilities and train himself to make them stronger. Me: What is Bill’s personality and his relationship with Zed like? Thusat: Bill is the comic sidekick. 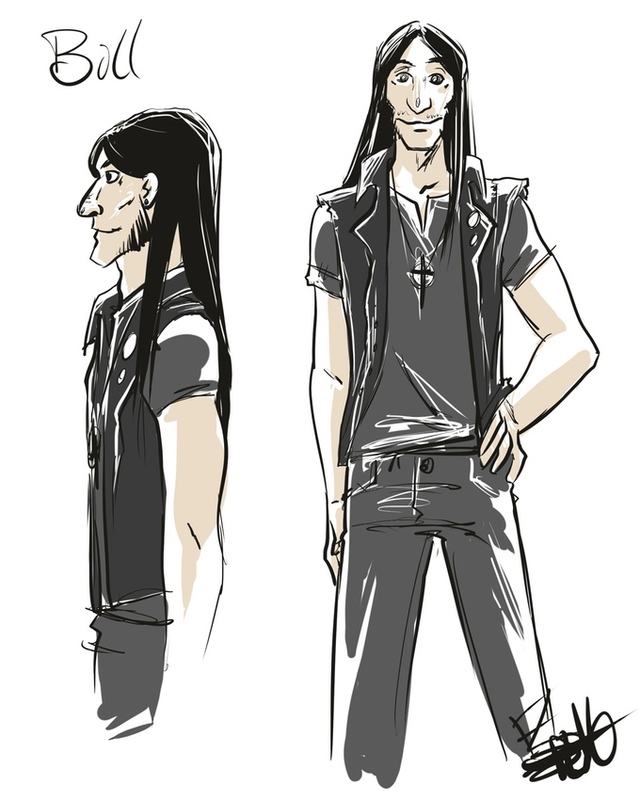 Before the outbreak, he was a Biker who was raised in a funeral home, and became a Biker/Mortician. He was saved by Zed and quickly became his best friend. This is Bill and Ted or Supernatural or even the Batman TV series’ Batman and Robin. They play off each other very well, and they keep each other alive. Bill’s skills as a mortician help to preserve Zed, piece him back together, and help him blend in to the world as a human. Me: What does a typical day for a survivor in the world of ZED look like? Thusat: Well, the world of ZED is on the verge of getting back to some semblance of normal. There was a huge outbreak that started a few years ago, and a lot of people died. Major cities have not been repopulated yet, but for the most part, suburban and rural life are starting to thrive again. There are still dangers in the world as there is no way to be 100% certain that everyone is vaccinated, and there are some groups and factions that embraced the chaos of the outbreak, and refuse to let the world get back to the way it was. Me: If you had to live in any zombie-ridden world from any form of media (besides ZED, of course), which would you live in and why? Thusat: I think I would have to choose something like Shaun of the Dead. I would want the zombies to be slow and predictable. I’m not an athlete, or really fit at all, and actually, I would probably be awful at killing zombies. So, I would need them to be useless, brainless, and slow like they are in Shaun or Dawn of the Dead. Sadly, the world would probably not be as fun and humorous as it is in that movie, it would probably be a lot more like The Walking Dead. I wouldn’t really want to live in any world overrun by zombies though. Me: Where would you go during a zombie apocalypse? Thusat: I would live in the country somewhere far away from people and cities. I’ve seen way to many post-apocalypse movies and read too many books. Zombies would not be my fear. People are awful, and at the first sign of an outbreak, I would get as secluded as possible. Me: How many issues are planned for Zed’s story and when do you plan on releasing the first issue? Thusat: Hopefully, this will become an ongoing series. My plan is to have the first issue out to Kickstarter backers by October or early November at the very latest. I have the first story arc written, which will probably cover 5-6 issues, but the potential for these characters and what they can do is limitless. Me: What do you think is the number one reason people should back ZED #1? 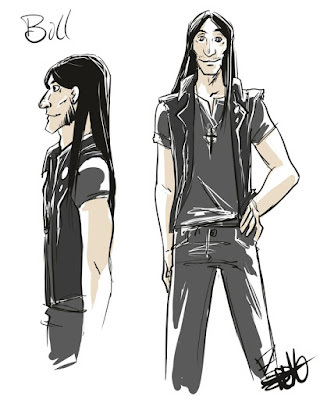 Thusat: ZED is going to be something special. It’s going to be an ongoing series with great artwork and wonderful characters. Simply said, you should back Zed because it is going to be amazing. Once issue 1 gets out into the world, people are going to take notice, and you can say to them “I knew about ZED before it was cool to know about ZED." Me: What can you tell us about your other comic, Alter-Life, and how does it related to ZED? Thusat: Alter-Life is the story of a man who discovers that he cannot die; instead, when he is killed he jumps into an alternate version of himself. The first issue explores Jake dealing with this new discovery and trying to figure out what exactly is happening. It’s really a story about past regrets, love, and loss. How feeling trapped in your existence can cause you to do things you might regret, and the desire to fix those mistakes. Alter-Life will be a limited series of 5 issues. ZED is really a stark contrast in tone and style, but there is a core theme at the center of both. Death. I’m not sure why, but my writing tends to gravitate towards a character that is unable to die. I feel that anyone can relate to these characters, their histories, and their desires. Death is a universal fear, and why not explore it with great stories like ZED and Alter-Life? Me: You started writing comics over this past year. What made you want to start writing comics and what is your favorite thing so far about writing them? Thusat: I came from a filmmaking background, but I started reading comics about 10 years ago. Independent film producing is very limiting. You can’t afford to explore grand science fiction ideas with a 30,000 dollar budget, so I decided I would try my hand at writing in comic book form. I went to Comic Con Chicago last year and was so inspired by the people and the talent, I came home and wrote three different comics. My favorite thing about writing for comics is the freedom. I can literally write anything I can think of, and I know I can find an artist to make those thoughts come to life. It’s also great to only really have to have a back and forth with one or two people. Filmmaking requires a lot of people, a lot of hands, and a lot of egos. Comics are simple, beautiful, and can go any place your mind will take you. Thusat: Don’t aspire to be a comic book writer. Just BE a comic book writer. People are out there that will want to read your work. Publishers are great, and they can make wonderful things happen for people, but the only person who can stop you from being a writer is yourself. 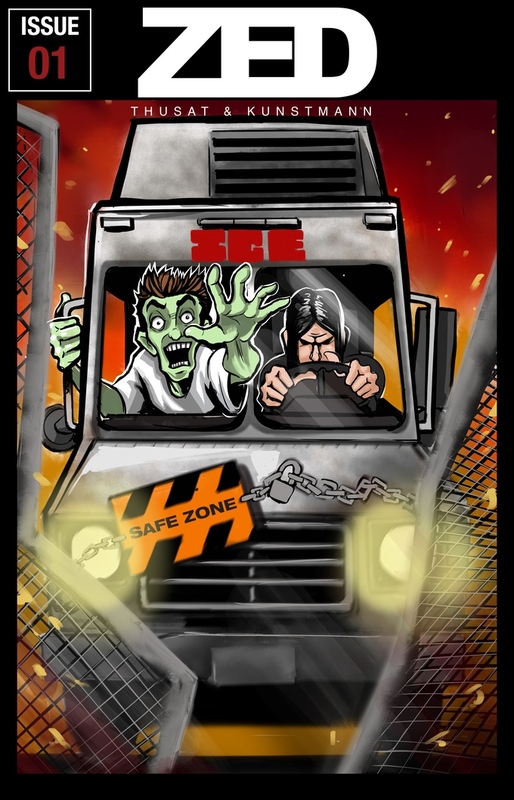 Katrina Kunstmann: ZED #1 is an original, fresh story in the ZomCom genre, which addresses not only the struggles of survivors still among the living, but also the fact that our protagonist is a zombie himself. It's a great ride very much in the same vein as Shaun of the Dead, comedically dark, but with a larger over-arching plot that contends with the root of the outbreak at its core and makes it a personal matter of ZED. 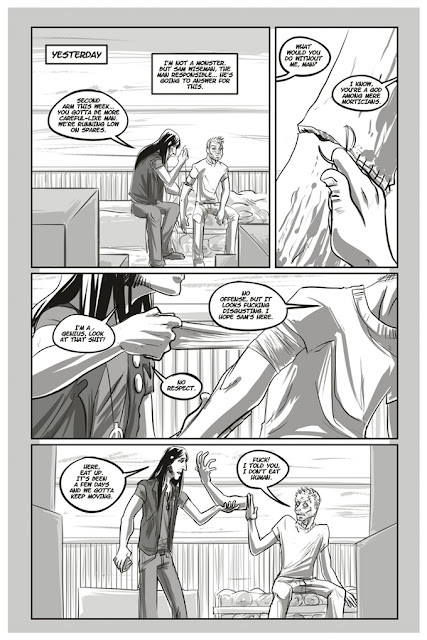 The interactions with Bill and ZED are snappy and I get a kick out of drawing them and much of the grim humor that comes along with an undead protagonist like ZED as he strives to reach his goal—eyeballs hanging out of sockets with an expression of numb frustration, limbs popping off and so forth—without it being too grotesque. It's a great story that everyone can enjoy, if they can handle a touch of gore. I'm really excited to be working on it! Me: How did you meet Caleb and begin working on ZED with him? Kunstmann: We've worked before on his other title, Alter-Life. We actually met on a freelancer website; I replied to his job posting. 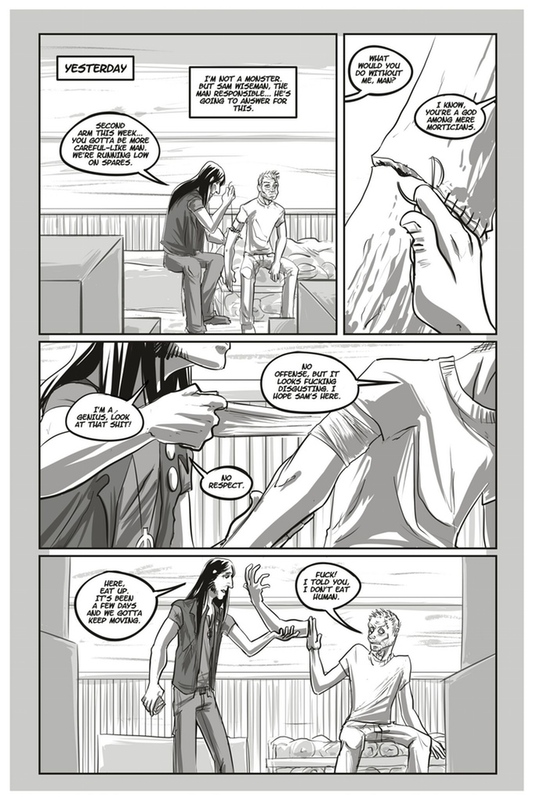 He let me take a gander at the script for the first issue of Alter-Life and I loved it and wanted to see where it went. After Kickstarting and printing Alter-Life, Caleb got in touch about ZED and I jumped at the chance to do more work with him, especially since ZED is a comedy. Me: If you had to live in any world overrun by zombies from any form of media (besides ZED of course), which one would you live in and why? Kunstmann: Honestly, I'd probably go with Shaun of the Dead, if that counts. Because I know I'd die pretty quickly, but at least it would be funny when I bit it. Me: Where would you go during the zombie apocalypse? Kunstmann: Haha, I'm probably go back to my parent’s house, realistically. There is only one access road in or out, it's in the middle of nowhere in the mountains of Central California, lots of gun and knives, and an industrial size freezer. My friends and high school lauded its defendilitiy in the event of a Zombie Apocalypse whenever they visited. But if I could pick anywhere probabaly a sustainable island. Or someplace in the desert or the tundra, presuming the undead were due to biological reasons, and not necromancy. Me: The Kickstarter page mentions you’re a big nerd, which started when you were five watching your brother play Legend of Zelda: Link to the Past. What is it about this game that helped make you into who you are today? Kunstmann: Honestly, it was very much my gateway into video games as a whole. I was dazzled by the concept and the world, the colors, the music—I'd never seen anything like it! It was the first video game I'd laid eyes on and I was utterly enchanted. Whenever my brother got a new game, he would play and I would watch or we would take turns. A personal favorite on the SNES was Super Metroid. Video games in turn were my gateway into larger aspects of nerd/geek culture—video games got me into anime, manga and comics, which got me into film and film studies, which somehow wrapped back around to comics. Me: One of the rewards people can get is your other comic book, Warhead. What can you tell us about this comic and your role on it? Kunstmann: Warhead is a surrealistic slice of life about Adam, a graffiti artist in London who has a giant, acid green atom bomb for a head, and it follows his internal struggles in life, love and his career. 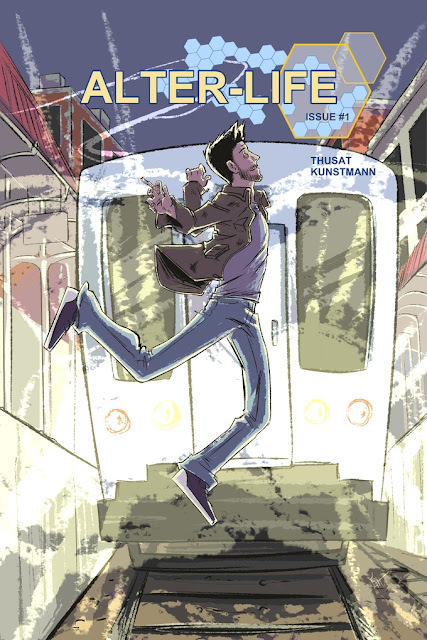 None of the characters have a normal human face or body, either animal or object heads or bodies, and it's a very darkly humorous romp about what it's like trying to make it in the city. It also leaves both the reader and Adam questioning what figments of the story are real and what are imaginings from his mind. 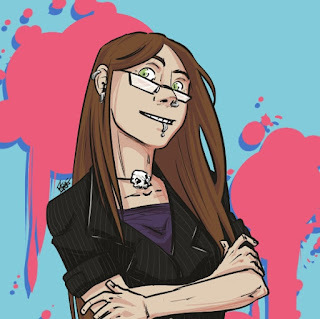 I write, illustrate, letter, and publish the comic on my own. I usually sling the pages over to a willing friend to check for typos and language cadence since it's set in London and it has been quite some time since I lived there. I'm presently working on writing issue six of Warhead, in conjunction with two other upcoming titles that I'm writing and illustrating. Me: What tips do you have for people who are interested in lettering comics? Kunstmann: Whooo, I'm not sure you're asking the right person! I still struggle with lettering properly. It's definitely an art unto itself, and like any art you must practice, practice, practice. I would say if you're drawing your own comic, try to make space for the caption balloons when you're roughing everything out. This doesn't always work if you work without a script like I do on Warhead, or if writer's have last minute changes, but it allows you to allocate space without it over-running the comic panels. Learn how to stack words in a caption properly, caption placement, and try to avoid balloons going out over the edge of a frame—unless you have good reason, of course! I do everything digitally, so for those of you who do it the old fashioned way, I salute you, that is a crazy hard skill and you're amazing. There are plenty of tutorials online that you can check out, and then just do it as much as possible, and when you're really good, call me so I can hire you to letter my comics. Kunstmann: I know it's been run into the ground on repeat, but just do it. Get out there, read comics, read paneling tutorials, and start making the material you want to read. Always push yourself to be better, but don't compare yourself to others. Pushing yourself will always ensure your work is improving, and not comparing yourself ensures you won't beat yourself up for not being Fiona Staples or Sean Murphy when you're starting out. Study the work you love—study the pacing, the shot choices, the style with which they tell a story. This to me is more important than your actual artistic style. The quality of your work will improve tenfold in all regards when you start working on your comics—line, art, storytelling, lettering—everything. If you read Warhead #1 (which you can get along with Warhead 2-5 if you back ZED for $5), you'll see a marked difference in line and art from the first page to the last. That was me finding my cadence. If you've never committed yourself to doing a comic before, you'll likely experience a similar transition. I never went to art school. 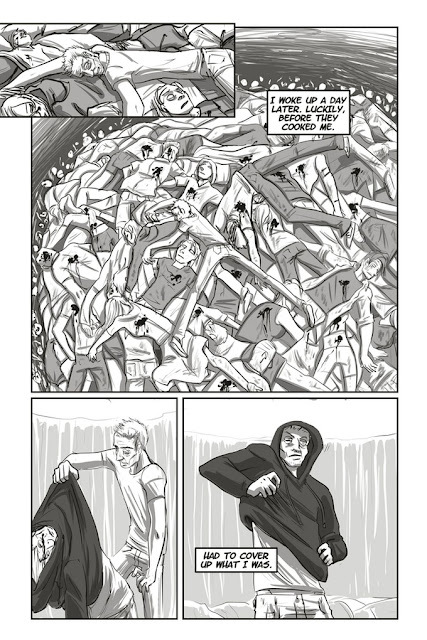 You don't have to go to art school to be good and make it in comics. You just have to be good at storytelling and making comics. Whatever mediums you've been influenced by before will only add to the quality and style of your voice. I went to film school for screenwriting. This lends my work a slow, atmospheric, almost storyboard-esque feel that is distinctly mine. Yours will be different and that is what's awesome about indie comics, everyone has something different to say and a different way of expressing it. Don't be scared of applying for jobs. Just build your best portfolio with a critical eye, know when you have a professional quality body of work, and get out there and knock on digital doors. And all that hubbub about self care and such, it really matters. Work hard, but don't burn yourself out. You'll just be playing eternal catch-up and running at half speed. Just do what you love and try to maintain the joy in doing it. Me: Thanks for your time Caleb and Katrina! If you’re interested in checking out their project ZED, see their official Kickstarter.